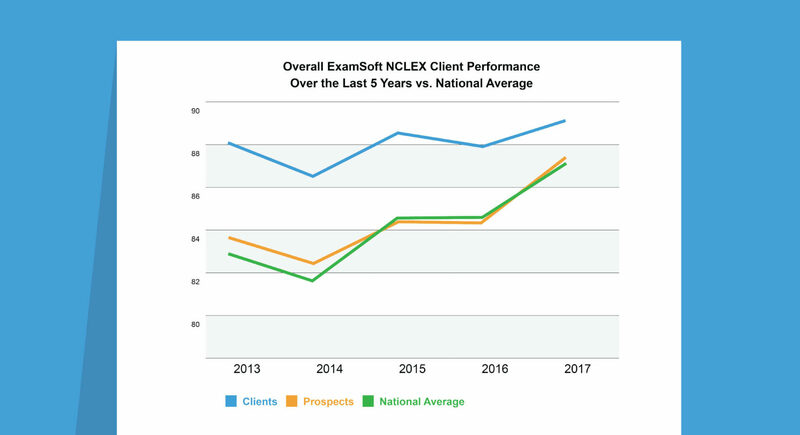 Nursing schools looking for measurable improvement on their program’s NCLEX pass rates should turn to ExamSoft’s assessment software. 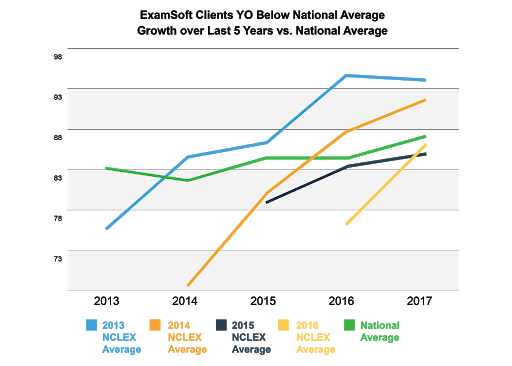 From 2013 to 2017, nursing programs that found themselves at or below the national NCLEX pass rate average saw a cumulative average increase of 8.4% on pass rates within their first year of using ExamSoft. More than 400 nursing schools throughout the world use ExamSoft to deliver formative and summative teacher-made exams that not only measure student learning, but prepare their students to be successful at their licensure exam. With the ability to “tag” exam questions to specific learning objectives or competencies, ExamSoft can then aggregate assessment data immediately, and provide both program leaders and students with an understanding of performance on different objectives—whether they’re based on course, programmatic, NCLEX, or even accreditation standards. By assessing students in this manner throughout their nursing school experience—and providing detailed, timely feedback on performance on specific objectives—nursing students are armed with the information they need to make self-directed study choices. Additionally, faculty know where to help with remediation or even curriculum review. With this proactive approach, any issues that could hinder success on the NCLEX can be addressed long before the day of the exam. Perhaps your nursing program is already tracking student progress with solutions such as ATI or HESI. 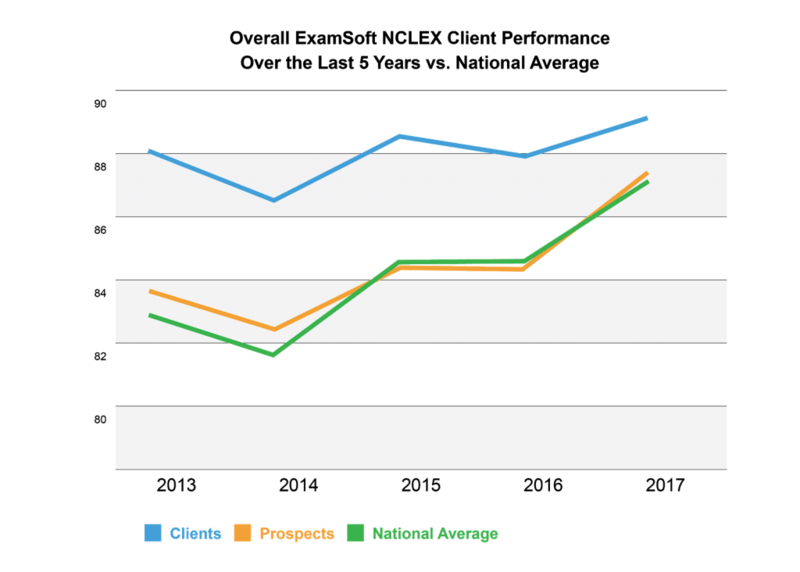 We’re not here to persuade you to abandon a good experience—in fact, ExamSoft works in tandem with both of those platforms to turn your good reporting method into a great one. According to a recent study, 83% of our nursing clients are actively using ExamSoft for teacher-made exams in conjunction with ATI or HESI and have found that it enables them to better track student progress throughout the semester than by simply using the spot checking of ATI or HESI alone. So let’s recap: ExamSoft provides an assessment software that supports nursing programs in their efforts to increase and maintain NCLEX pass rates by helping to identify at-risk students and pinpoint exactly where they need additional support. By providing this information from day one through their whole nursing school experience, students can walk into their licensure exam better prepared, and go on to become more successful nurses. Would your nursing school be interested in working towards a 8% NCLEX pass rate increase? Schedule a demo to learn more about how our software can help your nursing program succeed today! *Pass rate data was pulled from state board of nursing websites. Data does not include six states (Alaska, Hawaii, Michigan, Nebraska, Vermont, Wyoming) whose information could not be found. Decimals were rounded to the nearest tenth.